A sweet newly opened cocktail den. Yes, yet another speakeasy-ish place. But, this one has a grand baby piano for live ragtime music. 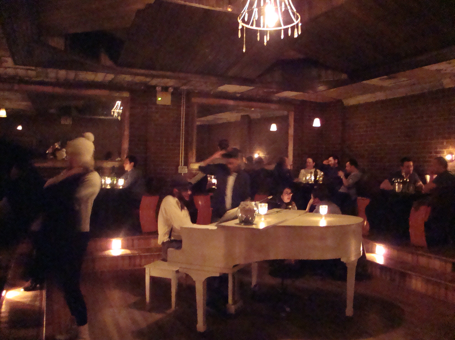 It’s a widely know fact that bars with pianos are more fun. Disclaimer: this place is in Greenpoint, not Manhattan. I guess the name Brooklyn Inn was already taken. (BTW neither are Inns) Cocktails are just $9 bucks, but just as fancy as what you find in the pricer and snottier zip codes and with a lower douchebag ratio. On a busy B&T weekends, trust me, this is a better Manhattan to be Inn. First opened in the 1850s as a prostitutes’ den, which lasted through Prohibition. The “Crisis” came from “The Crisis Papers,” which laid out why America had to break from England, written by Thomas Paine, who died in the same building. Feel free to inquire about the alleged ghosts, you will get an ear full. For the past 35 years, it’s been a super fun piano bar, where Broadway performers and wannabe Broadway performers sing the night away. “Do you your hear people sing?” yes “Guys and Dolls” alike all sing along. So “Tonight”, “Tomorrow” or whenever you go, “Make them hear you” when you sing along. Great place! Gets a bit overcrowded by middle aged gay men on the weekends, but always tons of fun! Piano Bar: Daily, 5:30 p.m.–4 a.m. This is probably my favorite bar in NYC. While many hot spots are trying to mimic speakeasys, Bill’s is the real thing. In 1924, Bill Hardy “opened” for clandestine business, and thus began the legend. Having been a boxer, a jockey, a dance instructor, a Broadway dandy and married to one of the Ziegfield girls from the legendary Ziegfield Follies, who better than Mr. Bill Hardy. Evoking the “Gay Nineties” as his theme (as in 1890’s), you’ll see everything from an autographed Buffalo Bill poster, boxers, to century-old playbills, to a bevy of famous Ziegfield girls, to a very young Al Jolson. Hardy exhumed the careers of many famous vaudevillians and hired them to rework their magic for a whole new generation in the 20’s. At its height, Bill’s featured three floors of rotating entertainers doing their act on one floor, taking a break, then moving on to the next. Every night was a party at Bill’s and every table a part of it. The infectious group sing-along continues to today. And yes, you really did have to ring a buzzer and whisper the correct password to get in. (Back then this wasn’t just a gimmick) After Prohibition Bill’s was often mentioned in many of the high profile columns of the day – Walter Winchell, Hedda Hopper, Jack O’Brien. And if you ask the 45-year-veteran maitre d’ Aldo, he’ll tell you exactly where Marilyn and Joe DiMaggio once sat. Today, the piano still plays, as people of all ages sing along. The Monkey Bar is just across the street, but Bill’s is where you’ll want to stay. When it comes to bars, it doesn’t get much better than this. Live Piano: Mon.–Wed., 8 p.m.; Thu.–Sat., 8:30 p.m.